Conflagration With Bangs, 2015. Acrylic and glitter on canvas, 72 x 84 inches. Intergalactic Emoji Factory, 2015. Acrylic and glitter on canvas, 72 x 96 inches. The Wishing Table, 2015. Acrylic and flashe on canvas, 72 x 60 inches. In a Cool Blaze, 2015. Acrylic and glitter on canvas, 72 x 96 inches. Arsenic and Old Lace, 2015. Acrylic and flashe on canvas, 24 x 20 inches. Cloud 9, 2016. Acrylic and flashe on canvas, 72 x 60 inches. Sala de Dos Hermanos, 2015. Acrylic and flashe on canvas, 72 x 72 inches. Weeki Wachee, 2013. Acrylic on canvas, 40 x 36 inches. 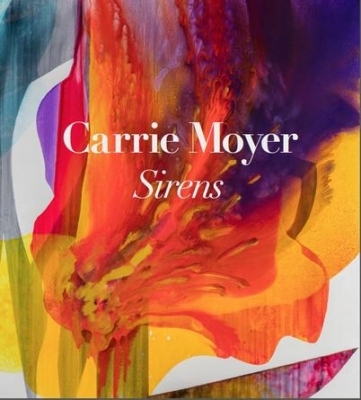 Sirens marks Carrie Moyer’s first exhibition with DC Moore Gallery. Moyer’s sumptuous paintings on canvas explore and extend the legacy of American Abstraction while paying homage to many of its seminal female figures among them Helen Frankenthaler, Elizabeth Murray, and Georgia O’Keeffe. Rife with visual precedents, Moyer’s compositions reference Color Field, Pop Art and 1970s Feminist art - while proposing a new approach to fusing history, research and experimentation in painting. An exhibition catalogue, with a conversation between the artist and Katy Siegel, will be available. Treating color more like a three dimensional substance, Moyer pushes its possibilities past the concrete, and the obvious towards a kind of “embodied” abstraction. In Moyer’s compositions color is the sole character, playing every role: energy, matter, ooze, architecture, the cosmic and the cosmos. Through her use of gravity, velocity and stasis Moyer transforms and frees vivid primary hues to express new kinds of animation or fullness, which in turn propels Moyer’s ongoing exploration of her medium. Each pour visibly changes speed or direction ultimately bursting out into blooms of color. Graphic portals and archways reveal slow moving tide pools or languid, floating odalisques. From deep red cavities to purple washes the infinite range of material allusion or pictorial illusion reveal Moyer’s ongoing experimentation in acrylic paint. In the studio, Moyer engages in a nearly taboo “erotics of craft," delivering the paintings of Sirens – each ready to sing their pleasure in streams of unfettered color. Carrie Moyer’s recent museum exhibitions include Three Graces: Polly Apfelbaum, Tony Feher and Carrie Moyer at the Everson Museum of Art, Syracuse, NY, (2015); Carrie Moyer: Pirate Jenny, (2013) organized by the Tang Museum, Skidmore College, Saratoga Springs, NY, traveled to SCAD Museum of Art and the Columbus College of Art and Design, Columbus, Ohio; and Carrie Moyer: Interstellar (2012) at the Worcester Art Museum, Worcester, MA. The work of Dyke Action Machine!, Moyer’s public art collaboration with photographer Sue Schaffner, is currently on view at the Brooklyn Museum in their exhibition Agitprop! through August 7, 2016. 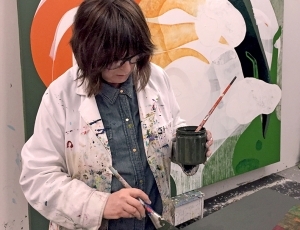 Moyer is the recipient of awards including the Guggenheim and Joan Mitchell Foundations, Anonymous Was a Woman, and Creative Capital, among others. Her work is in numerous public and private collections. She is currently an Associate Professor at Hunter College. Moyer lives and works in New York. Katy Siegel is the Eugene V. and Clare E. Thaw Endowed Chair in Modern American Art at Stony Brook University. Her books include “The Heroine Paint”: After Frankenthaler (2015) and Since '45: America and the Making of Contemporary Art (2011). Her exhibitions include High Times, Hard Times: New York Painting, 1967-1975, and she is the co-curator with Okwui Enwezor and Ulrich Wilmes of Postwar: Art Between the Atlantic and the Pacific, 1945-1965, opening at the Haus der Kunst, Munich, 2016. Gallery Talk about "Carrie Moyer: Sirens"
Join us for an gallery with Carrie Moyer and Amy Smith-Stewart, Curator at The Aldrich Contemporary Art Museum.